We are finally getting the 'Quetta ki hawain' in Karachi, and getting to enjoy the chilly weather properly. The fans are off, the sweaters are on (at least in the mornings and evenings), and I can enjoy eating dry fruits & nuts with Kashmiri Chai or Desi hand-whisked coffee snuggled up in a comforter. 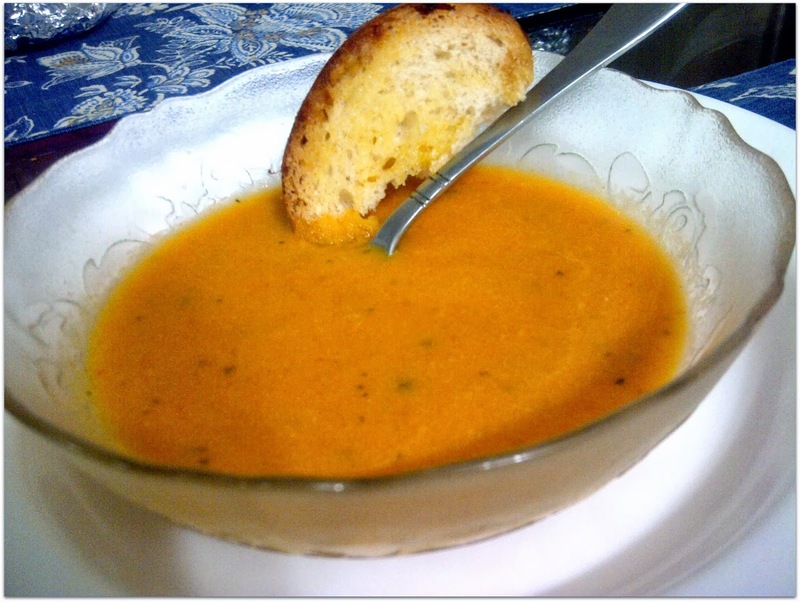 This weather is also perfect for a hot comforting bowl of soup and with fresh, ripe & 'affordable' tomatoes in season, I just had to make tomato soup! The recipe that I made calls for roasting the tomato & garlic in the oven, resulting in the most heavenly smell around the entire house. After that its just cooking on the stove, blending it up and its ready - serve it with toasted garlic bread for a satisfying lunch or dinner. Best part - this soup has no cream making it so much more healthier! 2. Line baking sheet with aluminium foil and put tomatoes and garlic cloves on the baking sheet. Brush both with olive oil, and sprinkle with salt & pepper. 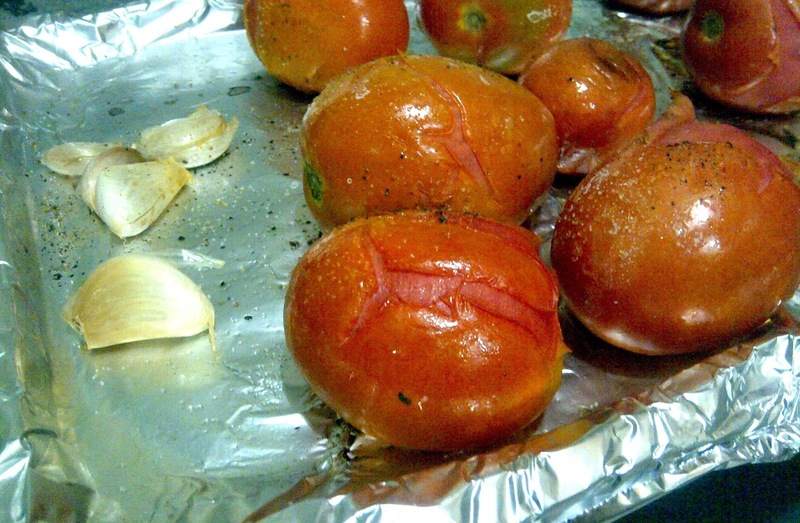 Bake for 30 minutes - the skin on the tomatoes should be slightly wrinkly. 3. Remove tray from oven, and set aside for 15 minutes till it is cool. Cut the top green part of the tomato, and you can also remove the skin of the tomato if you want (can easily be peeled after roasting). Squeeze the garlic out of its skin and keep aside. 4. Heat butter/oil in a pot. Add onions and saute for 2-3 minutes till light brown. Add chicken stock & then add all the tomatoes, the garlic as well as any juices from the baking sheet. Bring to a boil and then add basil leaves. 5. Simmer for about 45-50 minutes with the lid half closed. 6. Add salt & red chilli flakes. 7. Turn off heat, and blend with immersion blender until smooth. Alternatively, you can let the soup cool for about 15-20 minutes and then blend it in batches in a normal blender. 8. If preferred you can strain the soup through a sieve, which will remove any remaining seeds or skin, and will make the soup smoother. 9. Put the soup back on heat, add 1/4 cup milk and let it come to a boil. Add more milk if required, and also taste and adjust seasonings. 10. Serve with Garlic Bread (recipe below) or Croutons on the side. Preheat oven to 180 C. Mix the butter & garlic together. Make 1-inch thick slices into the bread, but don't go all the way through. Using a knife or a spoon, put about 1/2 a teaspoon of the butter mixture between each slice - make sure it is enough for the entire loaf or make more if required. Wrap the bread in aluminum foil and put in oven for 15-20 minutes till heated through. If the loaf is too long, then it can be divided into two parts, and this can also be baked in the toaster oven. Coming from Cookingadventurez. You have a lovely blog. All the best.